Toward the end of the 4th century BCE, new shapes and materials were introduced to Greek jewelry. The most ingenious innovation of the Greek goldsmiths of this period is the animal-head earring: a tapering, penannular hoop made of twisted wire with one terminal and the larger end in the form of an animal's head. 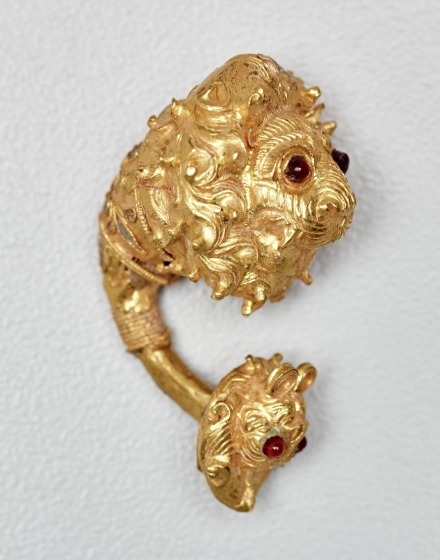 This single earring with lions heads is a classic example of the baroque style of jewelry common in the wealthy cities of Greek southern Italy during the Hellenistic age. 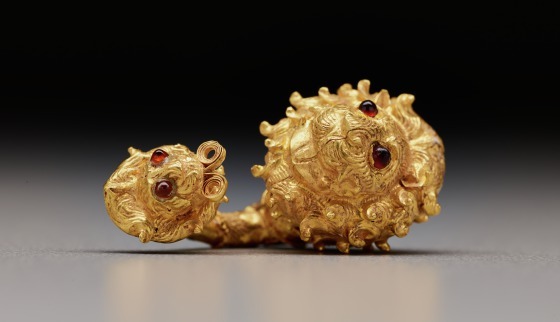 After the conquests of Alexander the Great, the Hellenistic world had readier access to gold and gemstones than ever before. Coloristic works like this became common. In this example, the hoop is made in two sections, both ending in lions' heads, though of different size. The smaller of the two lion heads is removable, and the larger lion's ears are also separately attached. The mane and the facial features of both lions are highly stylized; the lion's mane is particularly well defined by chasing. The teeth, tongue, and texture of the fur are carefully indicated. 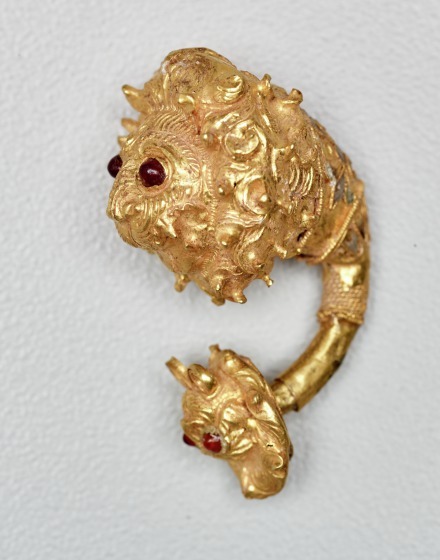 A double spiral made from rectangular strips of sheet gold is attached to the mouth of the smaller lion. Traces remain of the green enamel that once filled cloisons on the decorative collar. 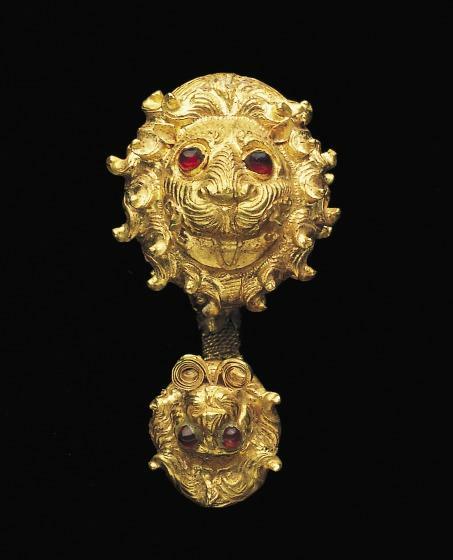 The larger lion head is especially dramatic, with its glowing red garnet eyes and flamelike mane. 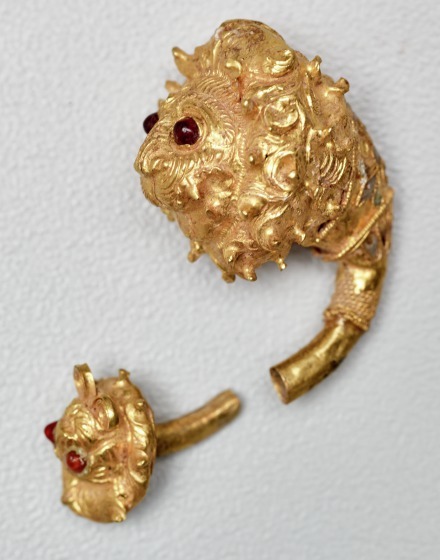 Anne Bromberg, "Lion-head earring," in Dallas Museum of Art: A Guide to the Collection, ed. Charles Venable (New Haven, NJ: Yale University Press, 1997), 32. Anne R. Bromberg and Karl Kilinski II, Gods, Men, and Heroes: Ancient Art at the Dallas Museum of Art. (Seattle: University of Washington Press, 1996), 114.